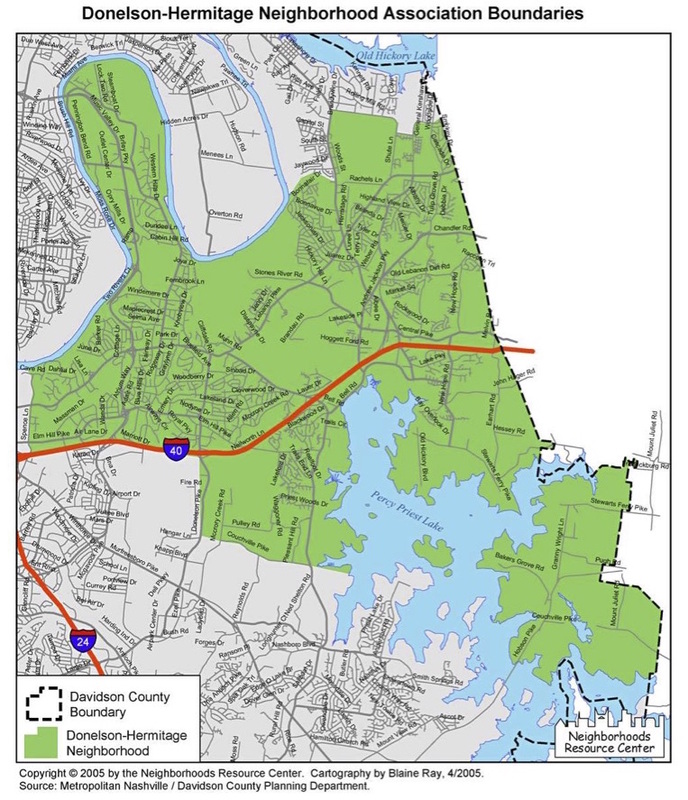 The Donelson Hermitage Neighborhood Association was formed in the late 1980s when a small group of neighbors from the Donelson – Hermitage area came together to oppose a 600-acre development in the bend of the Stones River because it was incompatible with existing neighbors. Later, when city officials proposed using the same 600 acres as Nashville’s city dump, DHNA rallied the community again. Both projects were defeated and it became clear that neighbors and neighborhoods are stronger when they stand together. Over the years, there have been many situations when DHNA has taken the lead to coordinate resources and bring neighbors together to protect and improve the quality of life in our neighborhoods. The Donelson-Hermitage community is healthy and vibrant; it has succeeded in capturing and preserving its history while finding ingenious and progressive ways to improve the quality of life for all who reside here. To help maintain and improve the residential quality of life in the Donelson-Hermitage community. To unite the membership of the Association located in Davidson County, Tennessee, for their mutual benefit and protection. To keep the membership apprised and informed as to events, proposals, developments, etc. occurring or to occur that may impact our area of membership. To be an active participant in public policy decision making processes that may impact our area of membership. To participate and have an input on future development that may impact the area of membership. To provide to our membership a vehicle of influence with public officials whose actions affect the area of membership. To provide a forum, for the benefit of our membership, where open discussion can be had with all officials holding or running for public office. To hold meetings and sponsor events and activities for the realization of our mission and purposes. To work toward enhancement of the quality of life of all Nashvillians by encouraging the implementation of planning for the future with more community awareness and input.